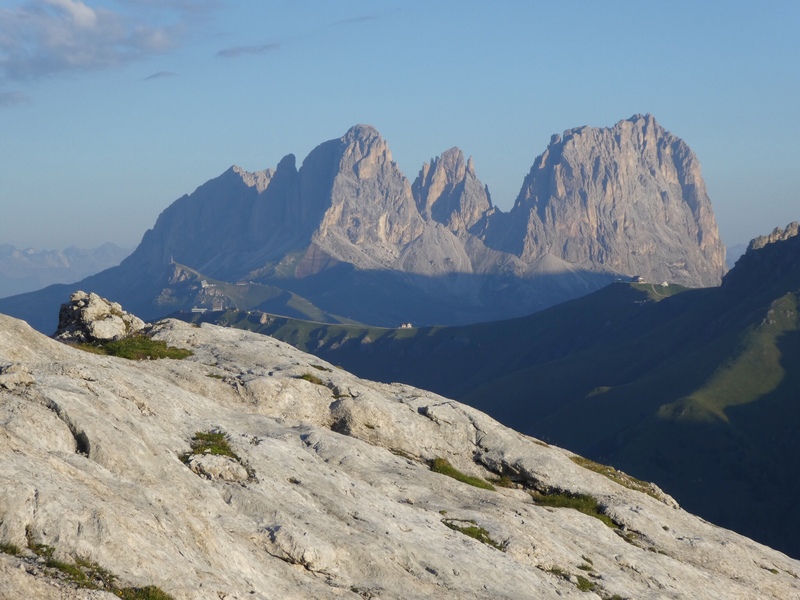 Fedaia Pass lies immediately north of the Marmolada, the Dolomites’ highest peak. 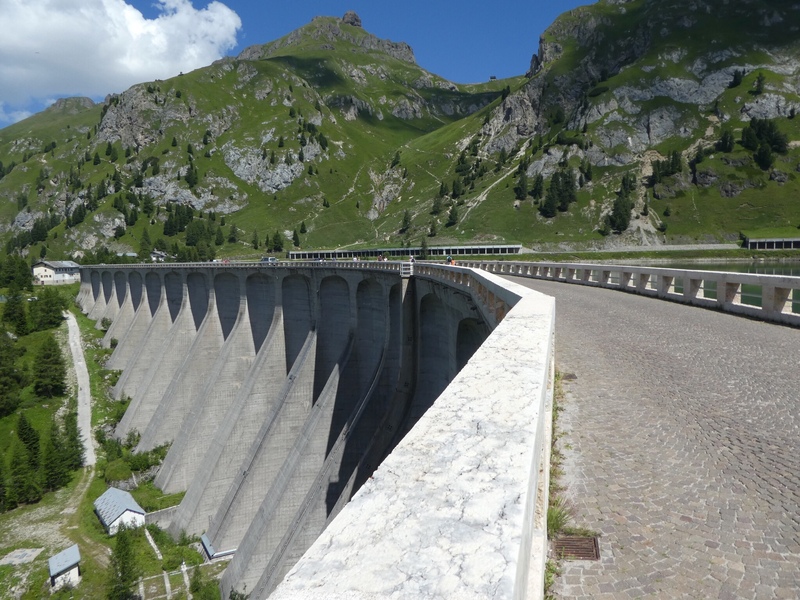 It is home to the unusual Lago di Fedaia, a reservoir with dams at both ends. 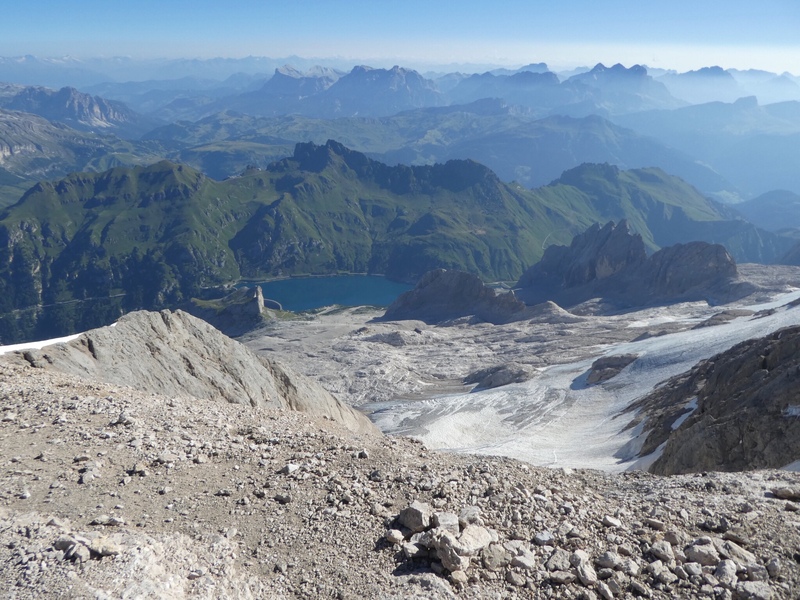 It is also swarming with tourists, who eat at a few restaurants near the larger dam, and ride a ridiculous old “stand in a basket” ski lift to another restaurant half-way up the long-suffering Marmolada. 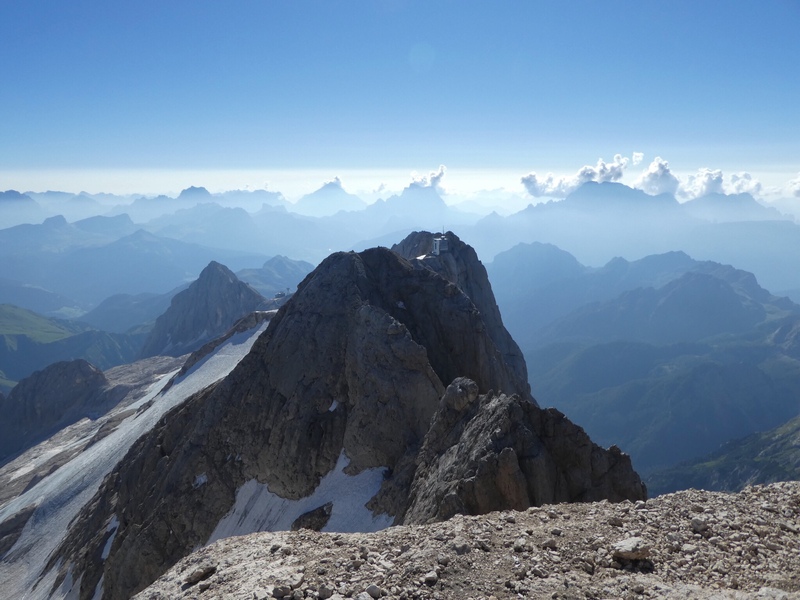 Marmolada is famous for long, hard routes on its sheer south face; the north face is an easy glacier climb, and the west ridge is an historic via ferrata. 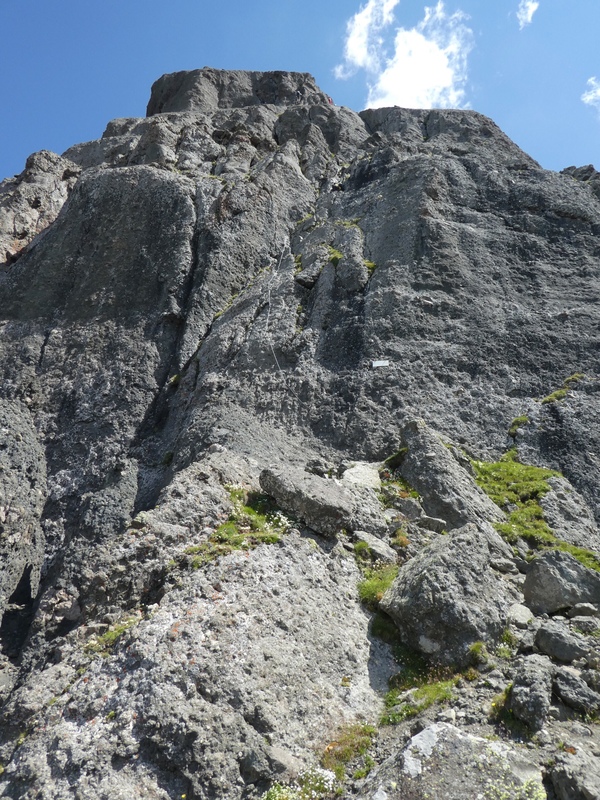 The peak was a battlefield during the World War I, and the west ridge ferrata was originally used to reach bunkers and artillery high on the peak. Most of the hardware has been upgraded in the century since, but you can still see the bunkers, and traces of the original ferrata. 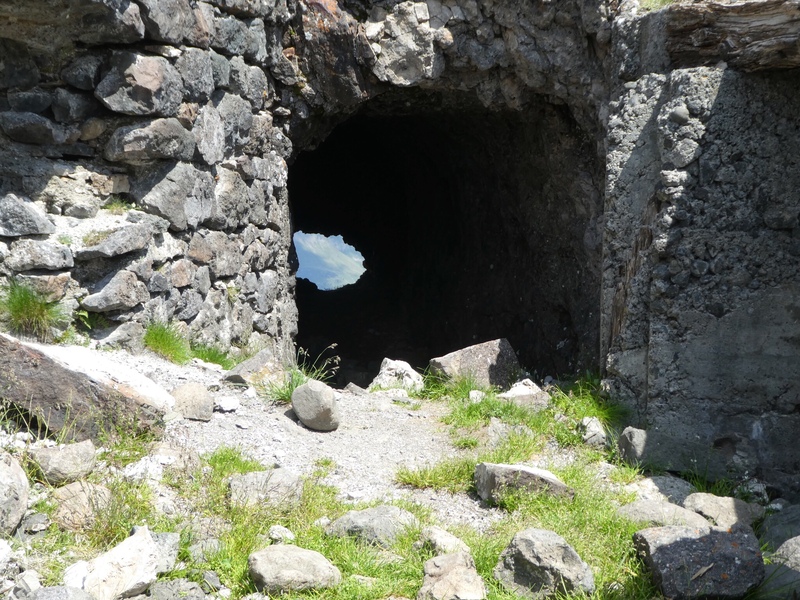 The opposing Austrians dug and inhabited a network of tunnels in the now much-diminished glacier on the face, which did not even last through the war, since of course glaciers move. 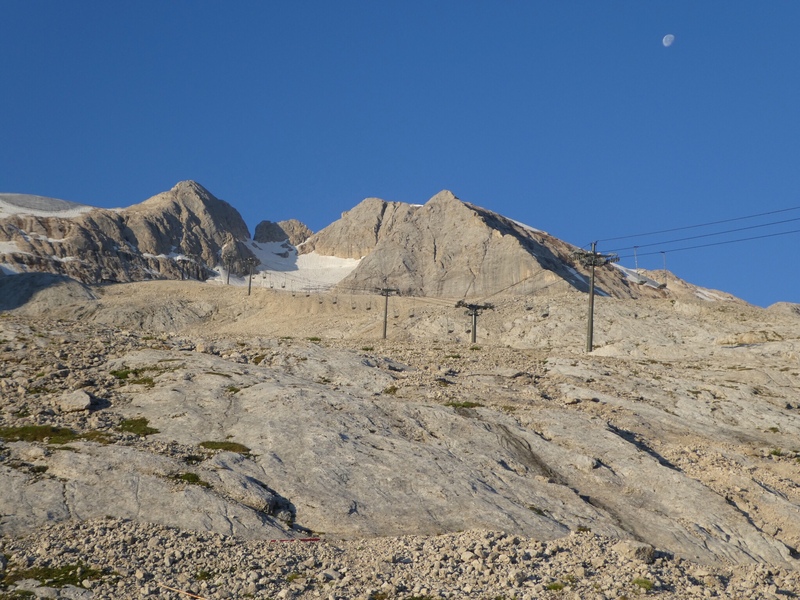 As suggested by Mountain Project, I went up the ferrata and down the glacier, taking five hours and change car-to-car. There are several trails leading to the top of the lift, and I followed the one starting at the large camping/parking area above the restaurants. Higher up, the trail was worse than the surrounding limestone slabs, so I took those instead. 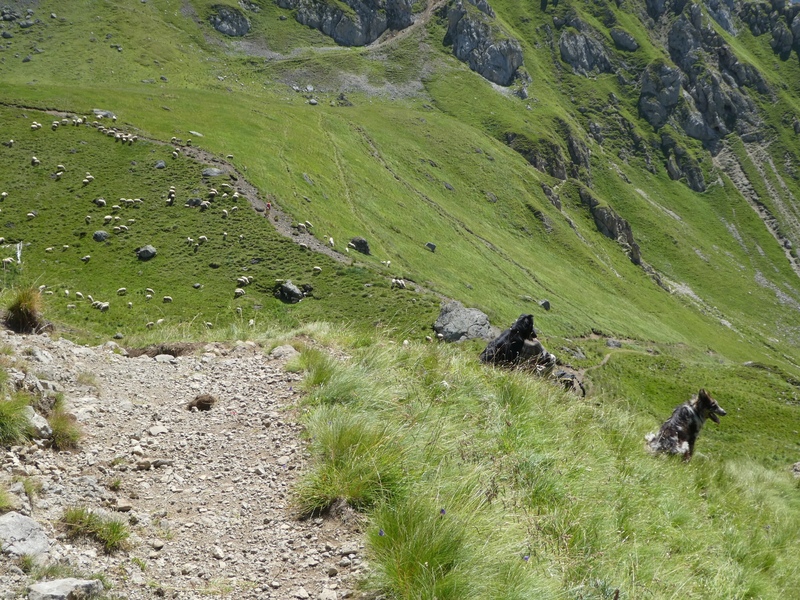 From the top of the lift, spotty cairns and bits of trail make a descending traverse to the base of the route. I started out staying too high, probably headed for a buttress on the north ridge, then descended some sketchy gravel-over-slabs to get back on-route. 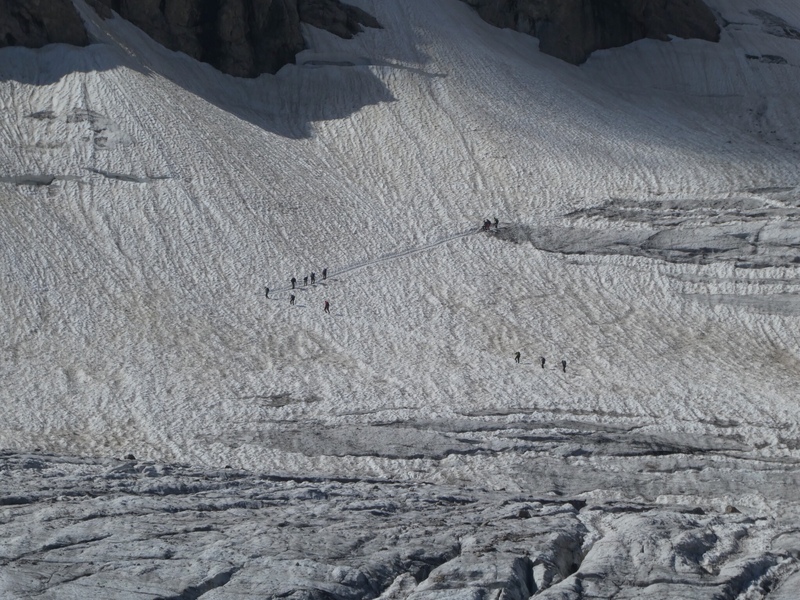 I could have gone around the bottom of a small glacier, but I had my ice axe and crampons, so I instead followed the diagonal boot-pack up to the start of the cables. 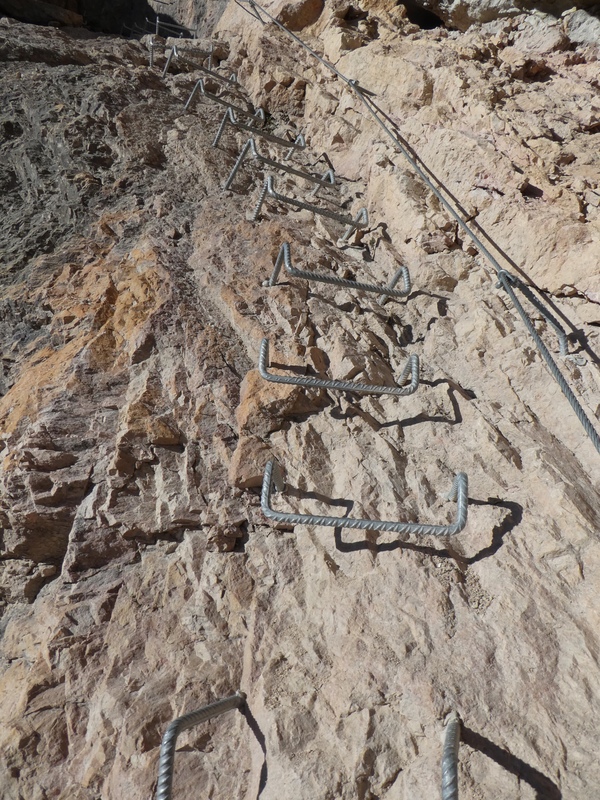 At the sign warning that this was a “difficult ferrata,” I put away the spiky things and got to work. 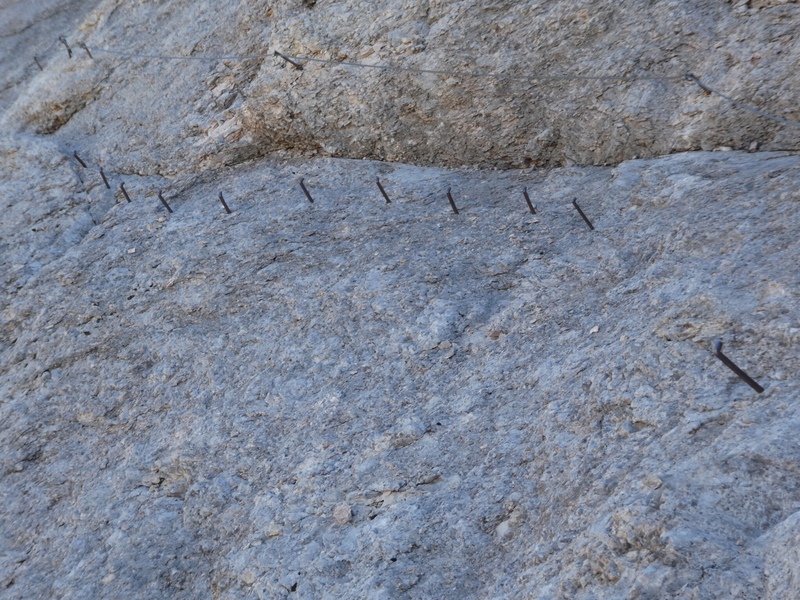 A via ferrata (or kletterstieg) has two things: a cable attached to posts, and (usually) some metal hardware driven into the rock. I believe the idea is that you wear a harness with two short leashes with carabiners, used to attach yourself to the cable. You then climb the rock (and optional hardware), moving the leashes past the posts one at a time. If you fall, you will slide back down the cable to the nearest post. In practice, people just yank on the cable, in part because the limestone nearby becomes incredibly polished. 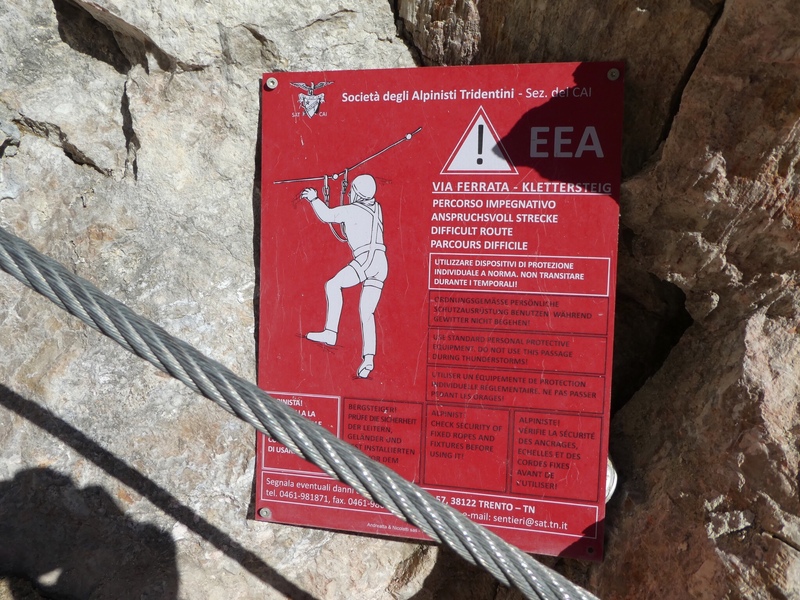 I have not seen someone fall on a ferrata, but I imagine the results would be painful but not fatal, and probably not require a rescue. I didn’t have the gear, so I just scrambled the thing. I was somewhat ambivalent about how to treat the cable. 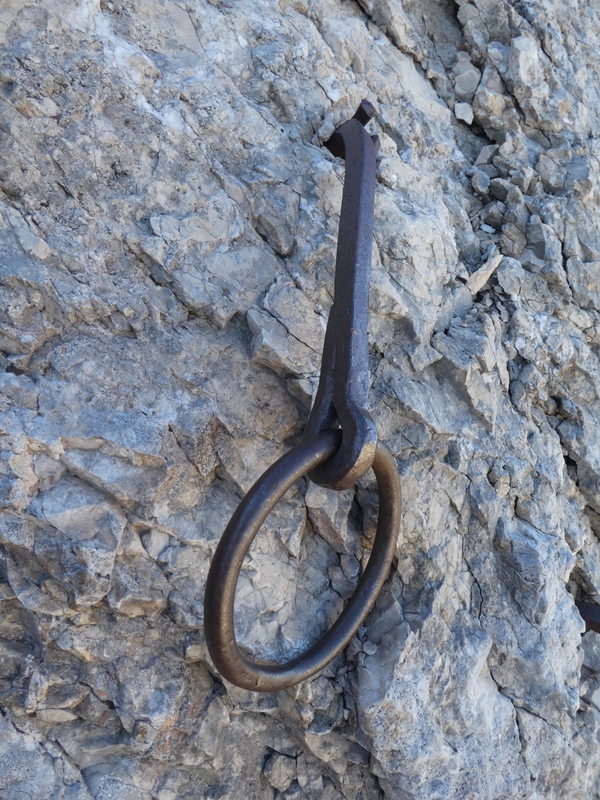 It is a less-than-ideal handhold, especially without gloves, so I ended up avoiding it when I could, but was not at all reluctant to grab it when it was useful. 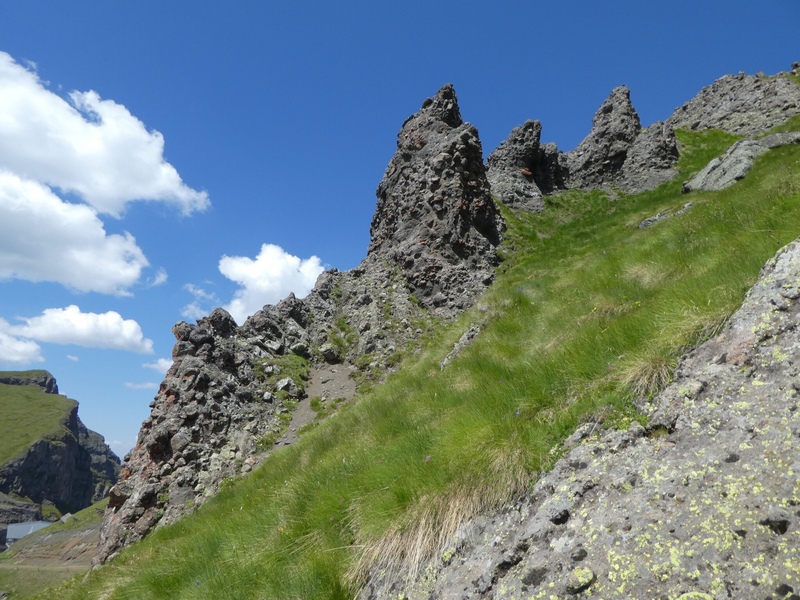 The climb remained fun, but it was more like playing on a jungle gym than mountaineering. 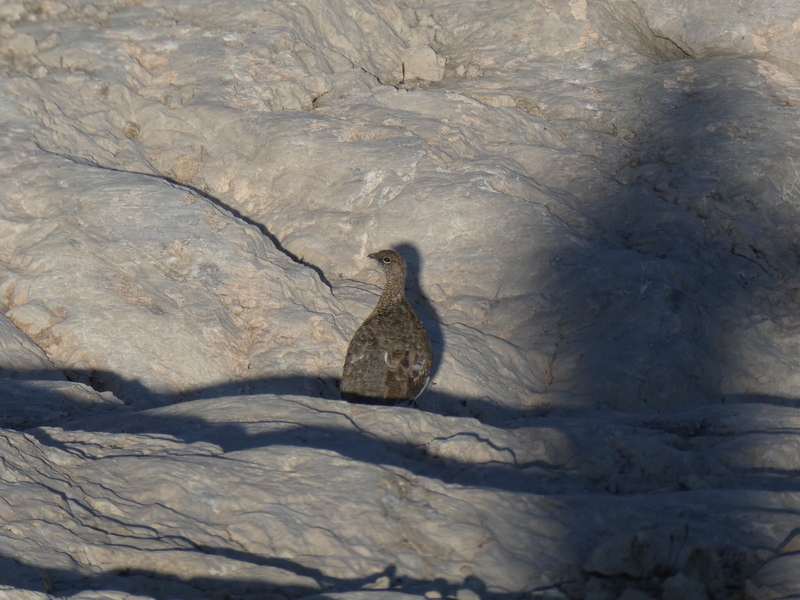 I had gotten an “Italian alpine” start around 6:00 to hopefully beat the crowds and the rocks they could rain down upon me, and it seemed to have worked. I was well ahead of two other groups starting the route, and quickly left them behind since I did not have to clip things. However, I was surprised to meet a German couple descending. 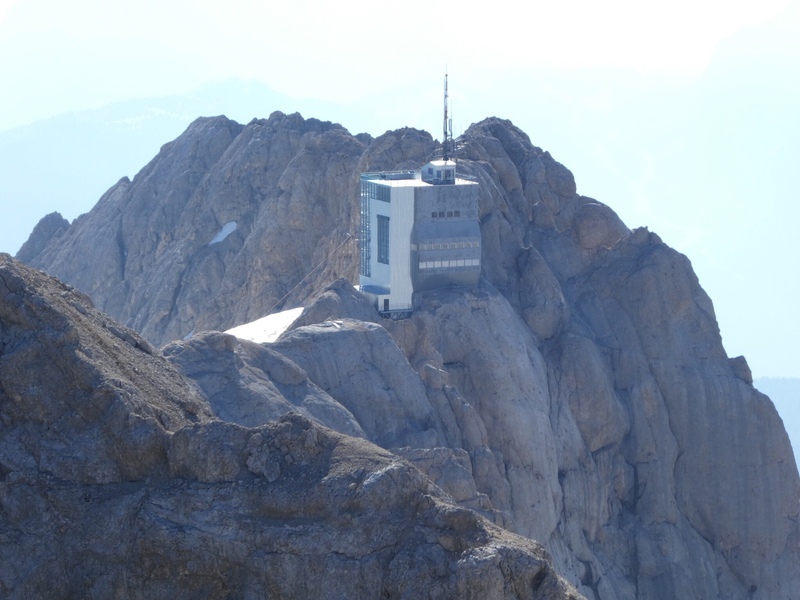 I had forgotten that there is a hut on the summit, where they had spent the night. 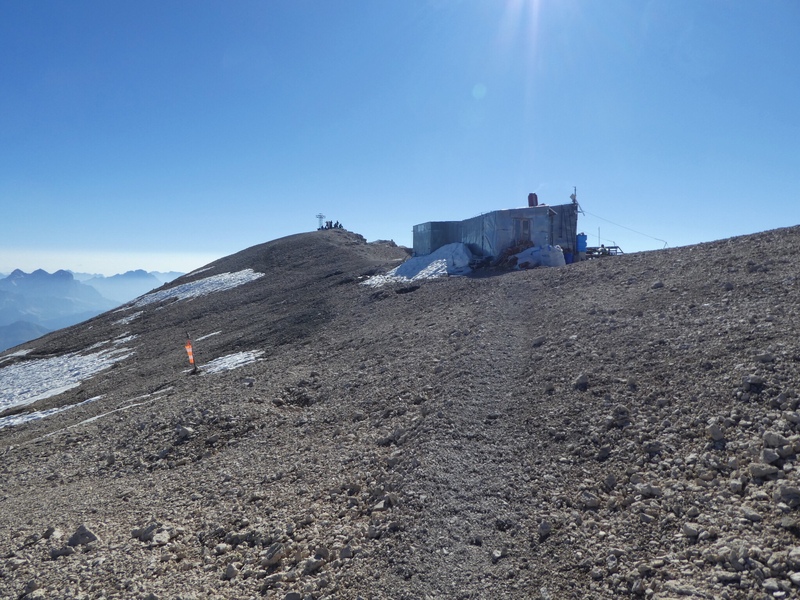 I climbed up various giant staples and metal bars for awhile, alternating with stretches of actual rock, then made a long scree-traverse to the summit, finally passing the hut’s apparent compost pile on my way to the cross. There were already a fair number of German-speakers at the top, who had come up the Glacier, including two young girls taking pictures hanging from the arms of the cross. I didn’t say anything, other than motioning that they should try some pull-ups. It was not even noon, so I needed something else to do. 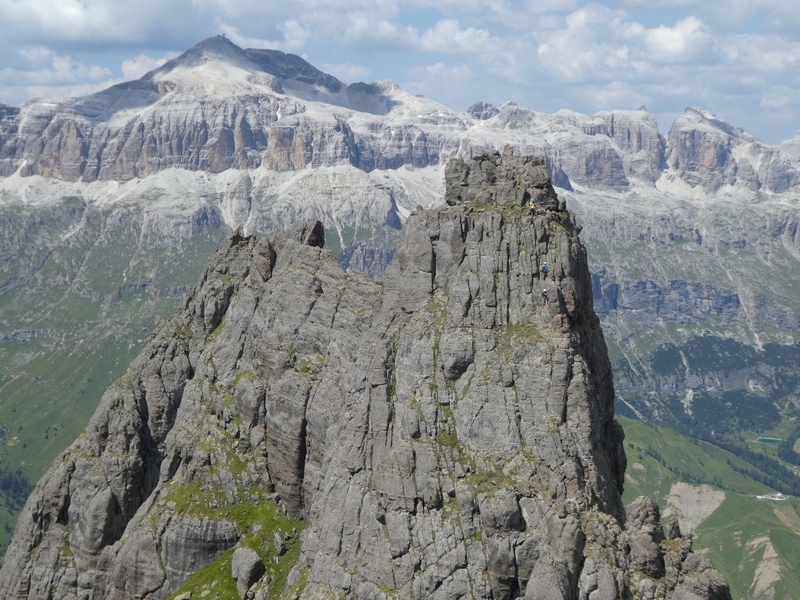 Another WWI-related ferrata on the other side of the lake had caught my attention for a couple of reasons: first, the rock was volcanic rather than the Dolomites’ usual limestone; second, it involved tunnels created during the war. I adjusted the contents of my pack, then walked across the dam to make the climb up the hot, south-facing hillside. 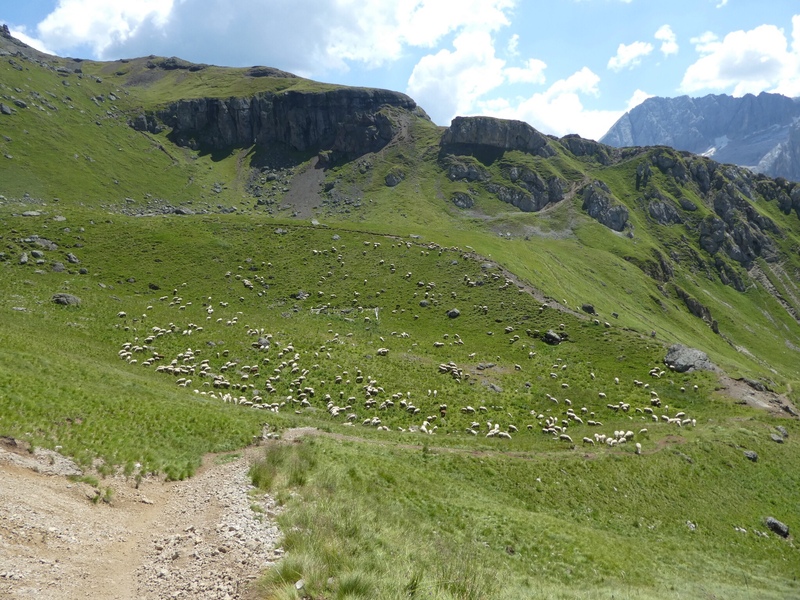 I passed a handful of people on the trail, then a large herd of sheep, accompanied by a shepherd and two sheepdogs. There were considerably more people on the ridge, since it can be reached by a gondola from the other side. I could see a steady stream of people on the first part of the ferrata, so I did not need the occasional signs painted on rocks. I was pleased to find myself the only climber at the base of the route, which starts up a steep face of dark, cobbled volcanic rock, with only a single metal step. I got maybe 10-15 feet up before getting stuck, unable to find a comfortable move up the polished face. I might have been able to go hand-over-hand up the cable, but probably not without gloves. I backed off and sat a minute, deciding what to do next. 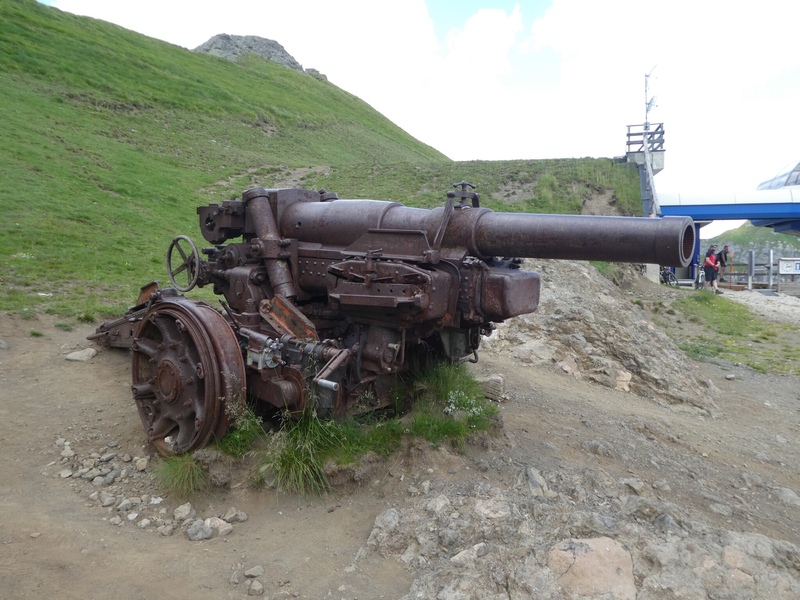 There were several faint trails along the southern base of the cliffs, and I contoured along one of these, then climbed back up some class 3-4 terrain that, with very little route-finding, joined the ferrata after its initial climb, right before a rickety bridge. Oddly, the rest of the route was much more thoroughly equipped and easier than the first, easily-avoided pitch. In particular, two sets of continuous rungs have been added to a 40-foot pillar standing to one side of the crest, likely a modern addition. 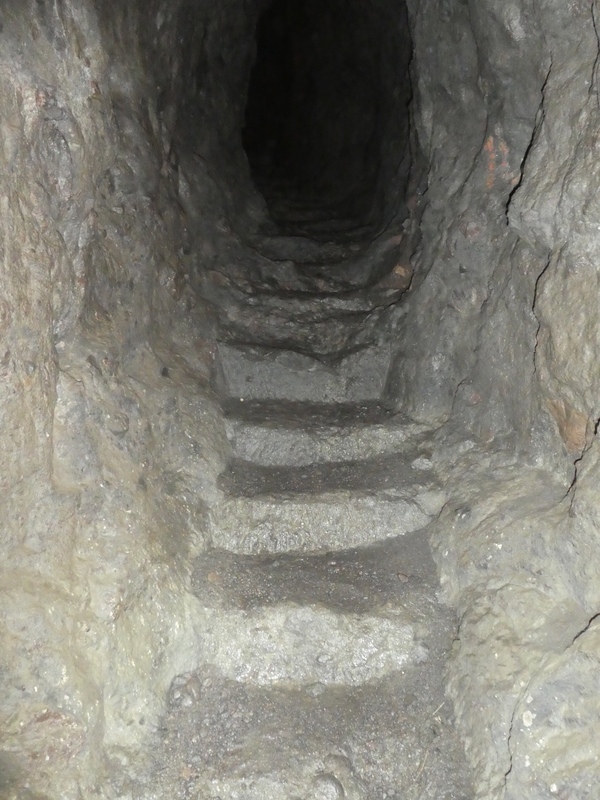 I found a few tunnels after the pillar, but they were disappointingly shallow, leading to what I think were artillery windows looking north. The crest is long, but fortunately there were long, fast stretches of walking on a path through grass. I passed dozens of people, none of whom seemed to give me a dirty look for not having the proper gear. 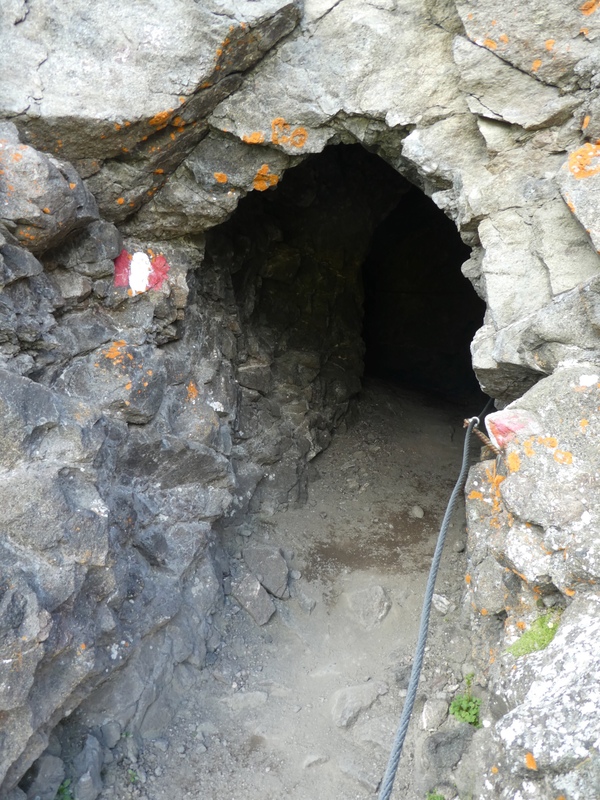 Finally, near the eastern end of the rocky ridge, I went through some significant tunnels. The first, maybe 50-100 yards long, passed from one side of the ridge to the other, through some living or storage quarters. The final one was more like a quarter-mile long, with multiple branching passages and painted arrows showing the path. It had a couple sets of steps, and connected troop quarters with more artillery windows. Emerging from the other side, I realized I was at the end of the route. 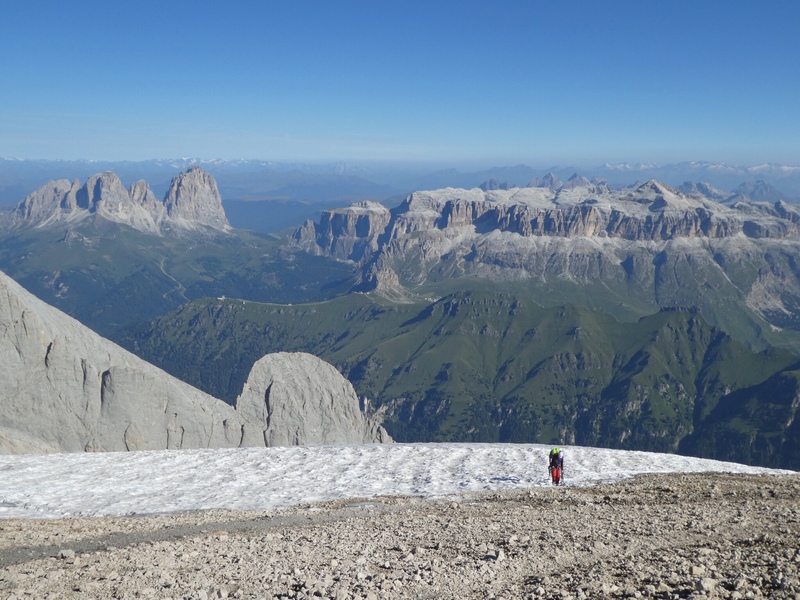 A short trail leads to the top of yet another ski lift, or a road switch-backing down to the eastern dam of Lago di Fedaia. I crossed to the south side, then walked the crowded pedestrian road back to my car, passing 20 or so young people swimming in the lake. Put together, the two outings made for a fairly full day. This entry was posted in Europe, Tourism. Bookmark the permalink.